Often people mix sugar to sweeten milk. However, we can use jaggery instead of sugar. There are several benefits of it. Anemia: Milk and jaggery contains iron. It is helpful from preventing in anemia. Skin: This drink removes toxins from the body. It makes skin soft and shiny. Menstrual: It has anti-oxidants. It is helpful in period problems. 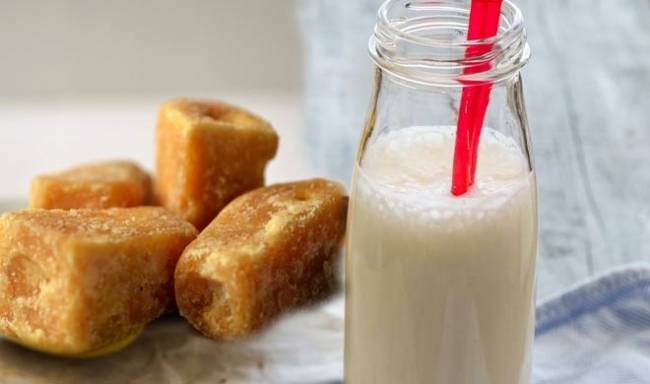 Cold-Cough: Milk and jaggery increases the immunity of the body. It is effective in cold-cough. Digestion: It has high amount of fiber. It helps from constipation. Blood Pressure: Milk and jaggery has high amount of potassium. It controls BP. Ageing: It has high amount of selenium. It is helpful in ageing. Diabetes: It controls blood sugar level. It is beneficial in diabetes. Urine Problem: It has diuretic properties. It is effective in urine problems.